Food reviewing is always so subjective as it depends on personal tastes, and if there are products that I really didn’t enjoy the taste of this month. It doesn’t mean that they are bad, they’re just not for me! I’m an occasional wine drinker. I prefer white wine over red, and prefer medium to sweet wines over dry, but other than that, I don’t really know much about wines at all. As I get older and my palette changes (which is does – I used to never be able to drink wine because it just tasted like vinegar to me!) I find myself drinking and enjoying wine a little bit more often than I used to. A company called Sip & Learn got in touch and asked if I would try out their new product – the wine tasting box. It’s a new way of drinking great wines, whilst learning about them at the same time. You subscribe to the box, and every month receive 2 bottles of wine carefully selected by their wine expert, Sylvain, as well as a comprehensive educational booklet to start learning all about wine. A great way to get introduced to wines, or if you are already a wine lover, a chance to try wines from smaller producers that you can’t buy in the shops. 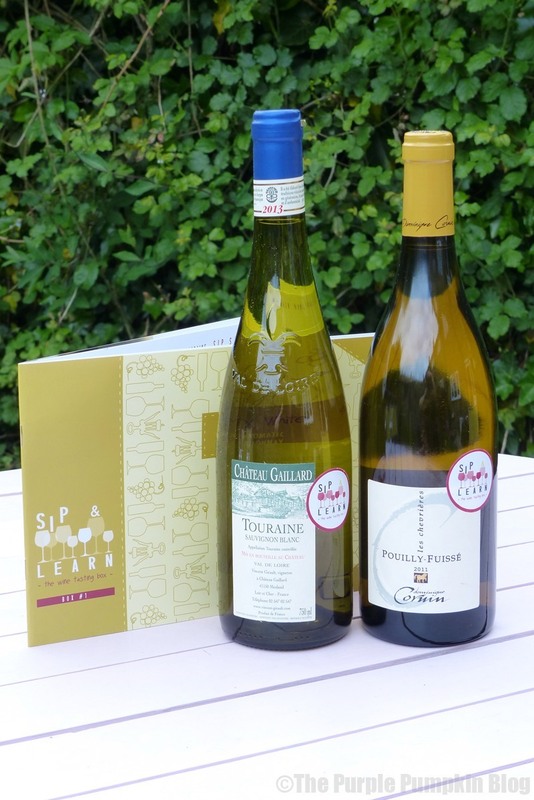 In the sturdy cardboard box are the two bottles of wine for you to try out, as well as the booklet to teach you all about the wines. The first box (which I actually received way back in December, but have only just got around to opening) teaches you about Sauvignon Blanc and Chardonnay. There is a little quiz at the start to test the knowledge you may already have (mine is zero!) and also teaches you how to taste wines. The key to really appreciating and enjoying wine is in the proper tasting of it. The booklet goes on to tell you about the basics of wine – the look, smell and taste. The booklet is well thought out, well presented, and a very interested read too. I was quite surprised when I tasted one of the wines and stated to my husband “ooh, this has a buttery taste to it” and lo and behold, the Chardonnay has hints of butter in the smell. Go me and my wine tasting skills!! There s room to record your thoughts on the wines, as well as food parings. At the very end of the booklet it tells you what to expect in your next box – Sip & Learn have devised a 12 month programme that will take you on a journey to discover the basics about wine. A subscription would make a fantastic gift for someone. The cost is £30 per month (+ £5 P&P), and it is non-binding. You can buy 1, 3, 6 or 12 month subscriptions. We both really enjoyed the wine tasting box, and learning more about the wines, and being taken through the steps, really did add to the enjoyment of them! 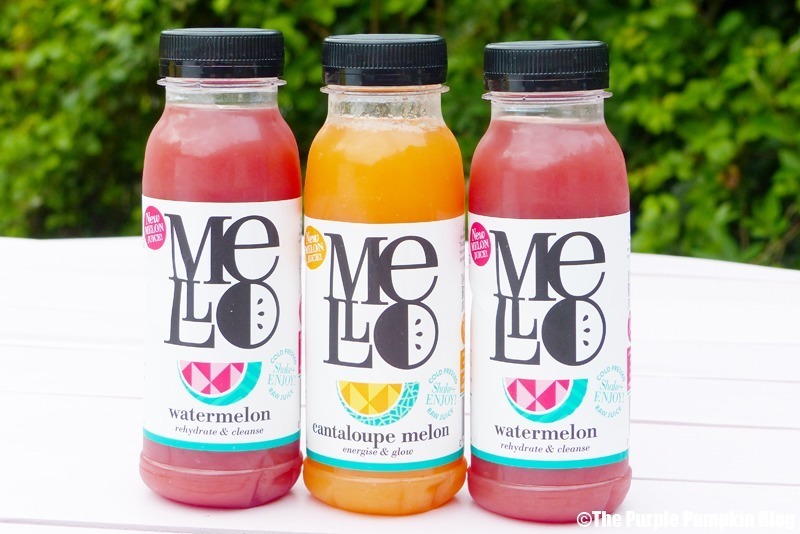 Great tasting and bursting with health and fitness benefits, Mello captures the goodness of a whole melon in every bottle, harnessing this wonder fruit to create a completely unique drink. 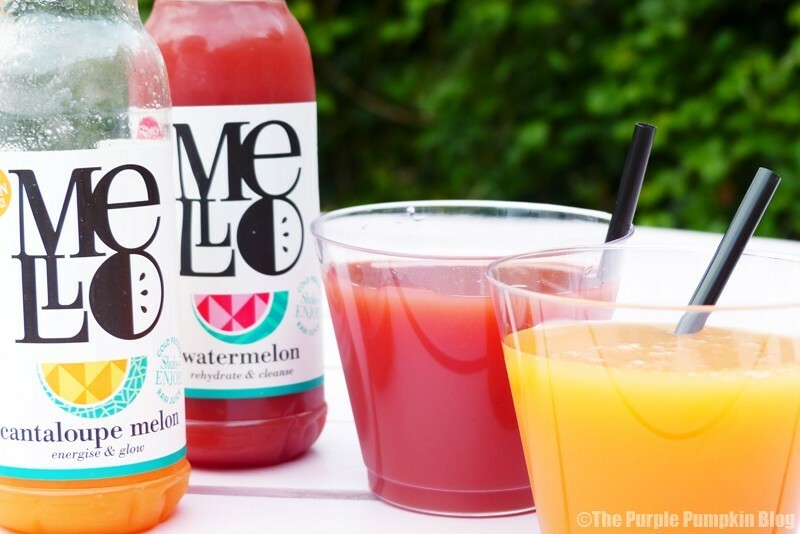 The next generation of juice brands, Mello is set to become the latest trend for consumers. Distinctly different, Mello is not created like other juices, it is produced using the cutting edge technology of High Pressure Processing (HPP). Determined to bottle only the purest, most delicious melon juice, the brand’s Founder Rose Aldean spent over a year on research and development before perfecting the production process. Mello shuns traditional juicing methods, which damage the taste and health benefits of the melon. It isn’t heat pasteurised, which can destroy the vitamins, minerals and enzymes found in fruit. It isn’t a cold pressed juice, which is filtered and sometimes has additives. Mello harnesses innovative HPP to create a juice that maintains the natural and raw goodness of fruit. Watermelon is a fruit that always reminds me of summer – especially holidays on the beach in Cyprus! So I was looking forward to drinking the two juices from Mello. I found the watermelon to be bit dry tasting, and to be honest, not packing the flavour punch that I was expecting. The cantaloupe had a sweeter edge to it, and I found it a lot nicer to drink. As you can see from the labels, the juices can help rehydrate & cleanse and energise & glow, and would be great for drinking after a workout…It rehydrates, speeds metabolism, detoxifies and is rich in potassium and L-Citrulline, which aids muscle recovery. Packed full of nutritional benefits that fuel and rejuvenate the body, it is also great for staying refreshed in the sun and for providing a boost to those suffering from the excesses of the night before! Flapjacks are so delicious, and even more so when dipped in chocolate! 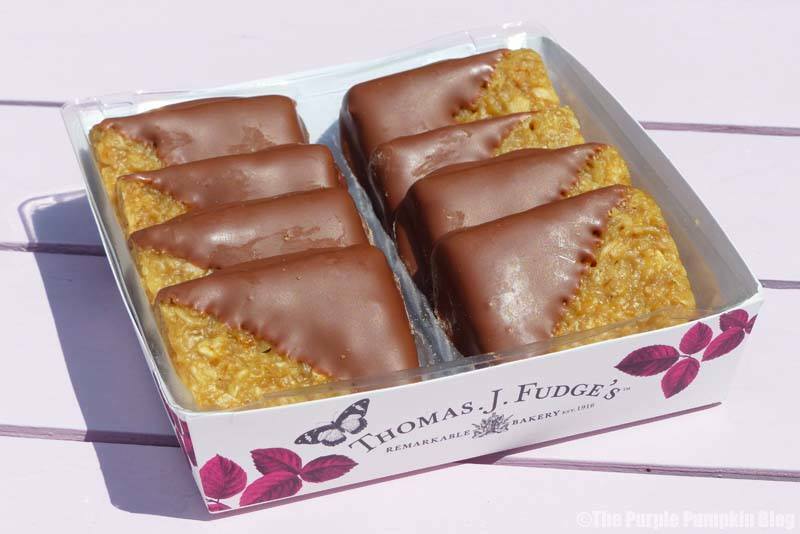 These Marvellous Milk Chocolate Flapjacks from Thomas J Fudge’s Remarkable Bakery went down a real treat when I brought them out for the family for afternoon tea! They came beautifully presented, and were full of flavour. At £3.25 for 8 flapjacks, they’re not an everyday thing, but for a special occasion, they’re worth the splurge. You can buy them online or at Waitrose, Tesco, Booths, Ocado, farmshops, and delicatessens. As well as a sweet box of treats, I was also sent a box of Many-Shaped Miscellany Of Biscuits For Cheese. Four different varieties of savoury biscuits which were: Deep Black Charcoal Hearts, Wholesome Malted Wheat Rounds, Crunchy & Rustic Fruit & Nut Crackers, and Crisp & Clean Water Biscuits, came individually wrapped inside a larger box, so you don’t have to open them all at once (although, I did to serve to everyone). I put them out on the table – and we all happily munched them without cheese! They were so flavourful all on their own – cheese will only help to enhance that flavour. This box is £4.50 and available at the same retailers listed above. 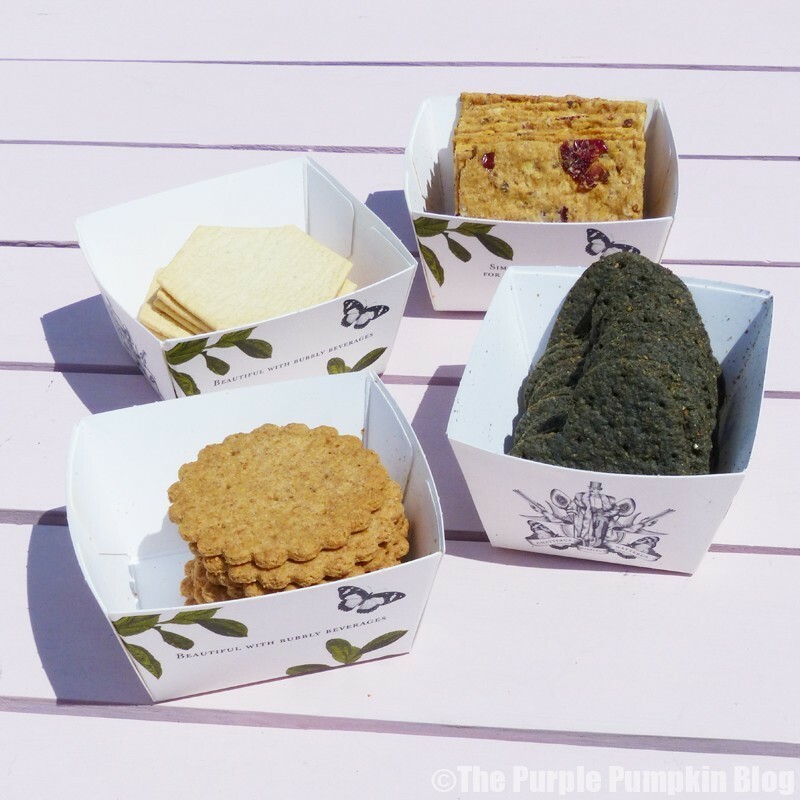 I not only enjoyed the flavour of the products from Thomas J Fudge’s, but also the design of the boxes, which were very whimsical, and were pretty enough to serve the biscuits as they were, without the need to re-plate them. These biscuits for cheese would make an interesting and tasty change from the regular boring old biscuits you can buy! I’m sure I’m not the only one who has called upon Aunt Bessie for help with the roast dinner – Yorkshire puds especially! Well, now, she has a range of cakes to add to her repertoire – and yours! 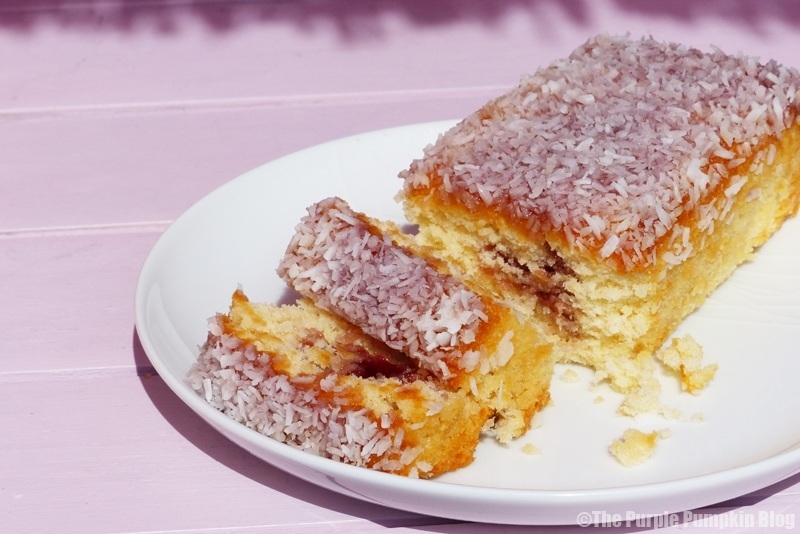 I was sent a pack of Aunt Bessie’s Almond Bakewell Tarts (£1.25 for 4), a Lightly Fruited Cake (£2.30) and a Jam & Coconut Loaf Cake (£1.50). At those prices,they’re great value when you are pressed for time and can’t make your own! 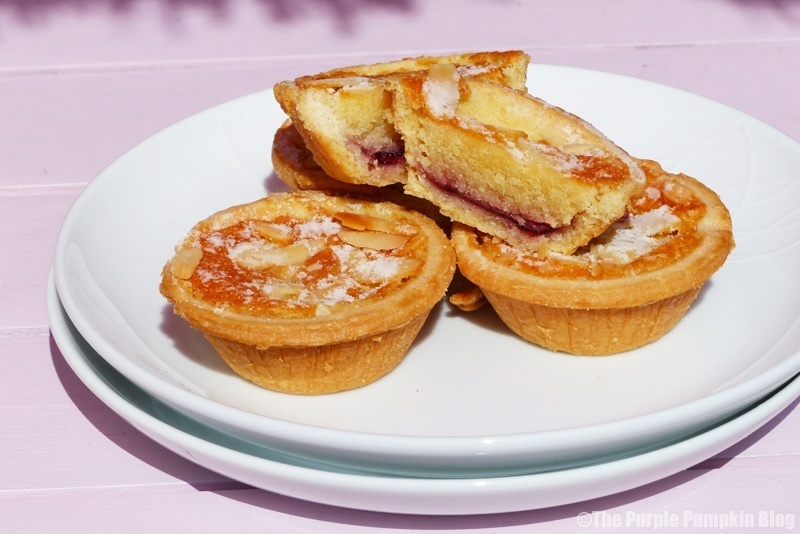 These came out at afternoon tea, and the bakewell tarts were the far and away winner – moist, full of flavour and a buttery pastry. The fruit cake however, was on the dry side, which was a shame, as it looked so good. And the jam and coconut sponge, which reminded us all of childhood school dinners (in a good way) was fluffy, jammy and delicious. 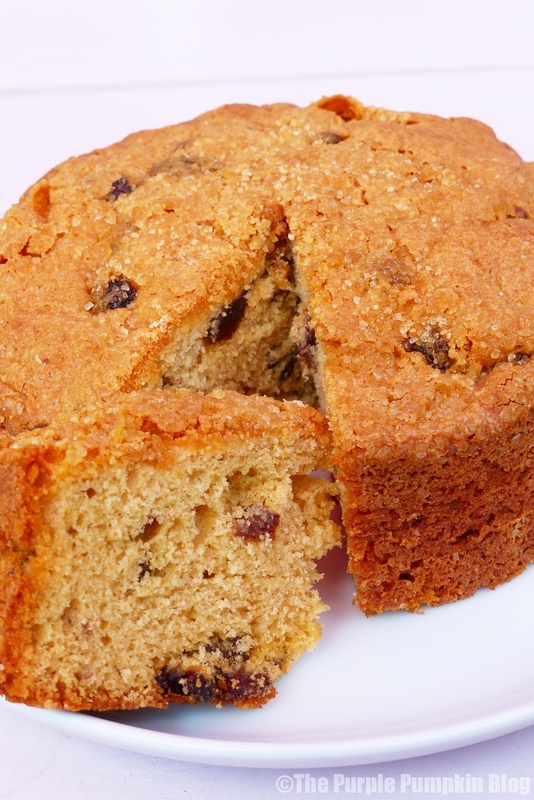 There are other flavours of cake in the Aunt Bessie’s new cake range: carrot cake and ginger cake in the loaf cake, which serves 6; and carrot cake and rich chocolate cake in the round, which serves 8. 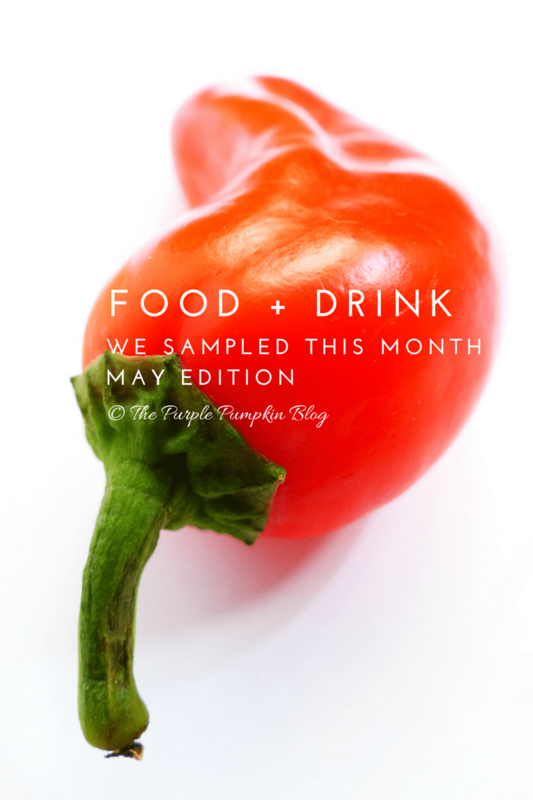 So that’s the food and drink we sampled this month! Have you tried any of these products? What did you think? Some delicious looking food and drink there. I love the sound of the Sip and Learn, very educational. Oooh I love the look of those Mello drinks, they look so refreshing… The flapjacks look great too. Lovely selection of items. The flapjacks with the chocolate corners look good.